Evidence is mounting that traditional batch and blast email marketing is broken. Without the ability to smartly segment and truly personalize email campaigns based on consumers’ actual behaviors on web and mobile, brands are simply turning up the volume in an attempt to rise above the noise. To get noticed in an increasingly crowded inbox, marketers must be able to leverage contextual customer data to effectively engage their audience and drive results. Join the upcoming webinar, “5 Ways to Use Mobile Behavioral Data to Send Engaging Emails” to see how brands can create impactful emails that are ideal for a mobile-first world. Kahuna’s Doug Roberge will lead a panel discussion including Yummly’s COO Brian Witlin about how innovative companies are rethinking email. This includes leveraging insights from consumer behavior across all channels to deliver the right message to the right person on the right channel. 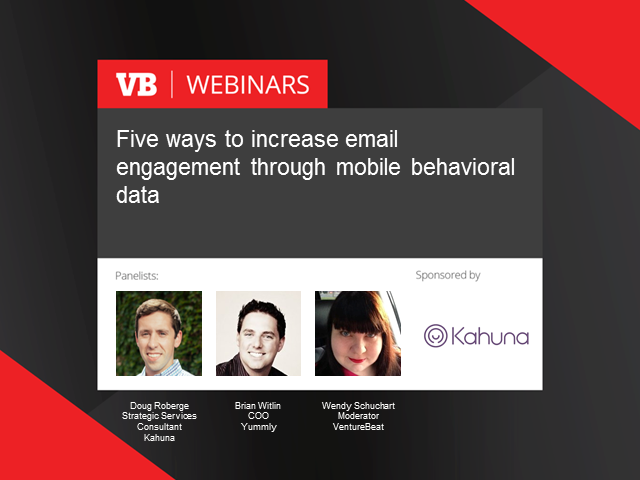 Please join us for “Five ways to increase email engagement through mobile behavioral data” on January 27, 2016. Even if you can’t attend live, registering ensures you’ll have on-demand access to the webinar materials. Save your seat today!